Christmas is knocking on our doors already and some of us didn’t decide yet about the gifts to be given at Christmas. Gift cards are in top preferences especially if you’re late with buying the gifts or when you want to know for sure you’re giving the right gift. Everyone has different preferences when it comes for clothing, shoes, food and more. Gift cards give the receiver the possibility to choose for himself the gift and you’re not giving the money for that directly. Give your friends and family to select the perfect present. It’s a great option for those who’re not sure about the gift to be bought and it’s a 100% guaranteed that the recipient wouldn’t return the gift back to the store. Send an e-gift card to a loved one, or use it as an online pre-paid card. They never expire and can be redeemed for millions of products. (Please note these gift cards are electronic delivery only, no plastic cards are sent). Look at the tips below because some could be of a great help if you didn’t manage to buy gifts for everyone on your list. 1. First make a list of those who’ll receive gift cards. 2. Make the list of things they prefer to know what exactly to choose when buying a gift card for someone. It could be anything beginning with movies to beauty saloons. When you decided you may go to the next step. 3. Make a budget for that. 4. Decide what gift cards to buy and check if you stick to the budget. 5. When choosing gift cards you must also consider the age of the recipient. After a certain age people prefer to receive restaurant or theater gift cards, gifts cards for arts and crafts but don’t rely mostly on age; rely on preferences mostly and you’ll choose the perfect gift card. 6. When you’re giving the gift card, don’t forget to put your signature and a personal message with a short explanation why you’ve chosen that gift. A gift card doesn’t say you’re lack of the ideas, it says you were attentive at preferences. The liberty of choosing the gift they want is better than receiving a gift they may not like and that could be returned afterward. 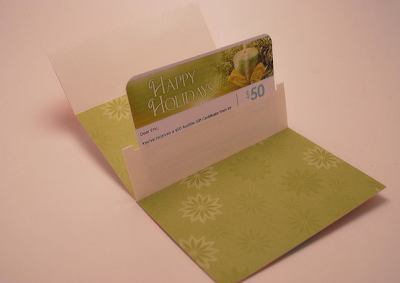 If a gift card seems to you a kind of impersonal gift, make sure the message to be very personal. There are a lot of options when choosing a gift card and there are a lot of gift cards that you can receive for free.